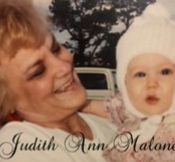 Judith Ann Malone, 78, went to be with the Lord on the 21st of January 2019. She was the daughter of Mollie Dee Campbell & James Marion Graves. She was the wife of Donald P. Malone, Sr. They shared 63 wonderful years of marriage together. She worked for HERTZ CORP. for over 20 years. The world has lost the most amazing wife, mother and grandmother. Her husband and her children were her ultimate dedication. Judith’s husband was her most amazing caregiver over the last seven years of her life. She is survived by her husband Donald P. Malone, Sr. Her sons Donald P. Malone, Jr. and Richard Lamar Malone Lowry (Dickie). Her daughter, Jamee Malone Lowry, Her grandchildren, Samantha Ann Taylor, Donald P. Malone lll, Richard Lamar Malone (Tricky). Her great grandchildren, Bella Rose Malone and Bayleigh Ann Joyner. The memorial service will be held on Monday, 28th of January at Pensacola Memorial Gardens. The visitation will be held at 10:00 a.m. followed by the funeral service at 11:00 with grave site to follow. Our sincere sympathy to Don and the entire family. May she Rest In Peace. Sorry Don to here about Ann. You and all the family are in my prayers. May the Lord give his amazing grace to all. Sorry we could not be there. What a sad loss for our family. May God’s infinite peace be with everyone. We are so sorry about Aunt Ann’s passing and are heart broken that we couldn’t make the trip from Texas in time for the funeral. We will keep everyone in prayer. Love, Marie Graves Gonzalez of Corpus Christi, TX.